Professor Pau Medrano Bigas, Professor of Graphic Design at the University of Barcelona, has forwarded several articles on William K. Vanderbilt Jr. and the Vanderbilt Cup Races from the Italian magazine La Stampa Sportiva published from 1902 to 1910. Dr. Andrea Fedi, Department of Cultural Studies and Comparative Literature, Stony Brook, with the help of his son Lorenzo Fedi, has graciously translated this article describing the reaction to the first Vanderbilt Cup Race. America has its own great automobile race. The yankee millionaires, who until now were either actors or the most treasured spectators in the great European races, could very well afford the luxury of a great automobile meeting. It's to W. K. Vanderbilt, one of the pioneers of driving, that America owes the superb Challenge Cup which took place on October 8 just outside of Manhattan, New York, on a 48-km (29.83 miles) race course, that had to be completed 10 times to reach a total distance of 480 km (298.3 miles), which comes out to 455 km (282.7 miles) once the controls are deducted. The Cup was international and even though America is working tirelessly on its automotive emancipation from the old Europe, the American market is still absorbing too large a number of the automobiles produced especially in France, to think that our big European brands would not have taken an interest in this great competition. As a matter of fact, among the 18 vehicles that entered the race only five were American, 5 others were German (Mercedes), 6 were French (3 Panhards, 1 De Dietrich, 1 Renault and 1 Clement Bayard) and 2 Italian (2 90-HP Fiats that had already participated in the Gordon Bennett). As for the drivers, France, which had made serious preparations to conquer the much-desired trophy, had sent over some of its best, such as Heath (a young American sportsman who for the longest time has been in all the great European races and was the winner in the Ardennes, Teste (the racer who was also in Italy), Tarte, Gabriel, and the young, very skilled Albert Clément. The five Mercedes were driven by some of the most renowned American amateurs, such as Arents, Campbell, Hawley, Wormser and famous racer Werner. The two Italian Fiats were left in the hands of driver Sartori and American millionaire Wallace. America fielded two Toledos (driven by Webb and Lytle), 1 Packard (Schmidt), 1 Royal (Tracy) and 1 Simplex (Crocker). The great expectations for this race created by the massive promotion by the American press made the race course crowded beyond description and made it more difficult to organize, in addition to the obstacle of the inadequate roads and the immense problems that, even in the free America, hinder automotive events. 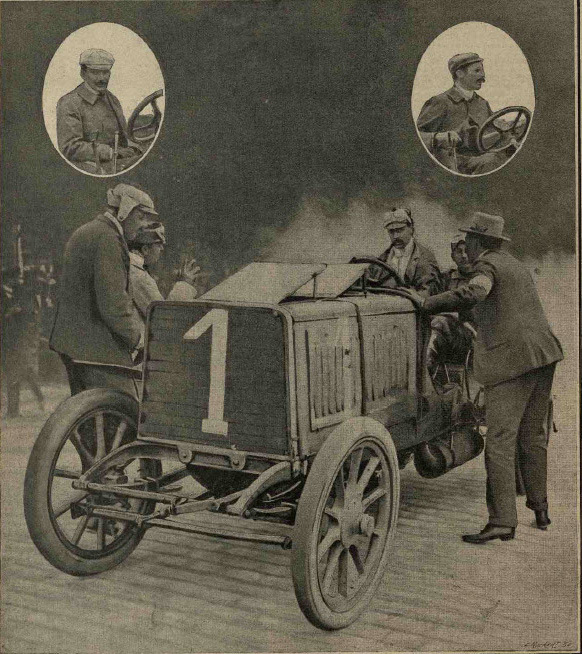 The story of the race, which we have to describe from the telegrams, was exciting, even though the French team was the favorite from the start and did not have any serious competition other than the Mercedes, since Fiat (handicapped by an accident that deprived one of his vehicles of its tires, which were left behind in customs in Genoa) could only line up a single vehicle, the one driven by Wallace, which obviously did not inspire the same fears that would be expected if it had had someone like Lancia or Cagno at the steering wheel. Number 13 was omitted from the numbering because of an American superstition, and Wallace's Fiat, which started last, had the number 19. The starts were at two-minute intervals and on the 1st lap Gabriel took the lead; on the 2nd lap Teste is first, and maintains that position even on the 3rd lap, while for the next five laps Heath is ahead of him, only to be passed on the ninth lap by Clément who had always been on his tail. But, he manages to regain a few minutes during the last lap and in the end he takes back the victory from him. The final results therefore give the 1st place to Heath (70-HP Panhard) in 5 hours 26' 45"; 2nd Albert Clément (Clément Bayard), in 5 hours 28' 3"; 3rd Lytle (American, Pope Toledo), in 6 hours 20'. This way the glorious French industry won even this much-desired trophy and the honor of the victory went once again to the great Panhard brand, while young America was left with the consolation of being able to say that Heath, the winner, is a yankee, and therefore the glory of the triumph did not emigrate once and for all to the other side of the Atlantic. Caption: Heath, the American, for many years a loyal Panhard driver, who had won the Ardennes Circuit, brought to the great French brand the much-desired trophy of the Vanderbilt Cup. In the top left corner, a picture of Teste, another Panhard driver in the American race. 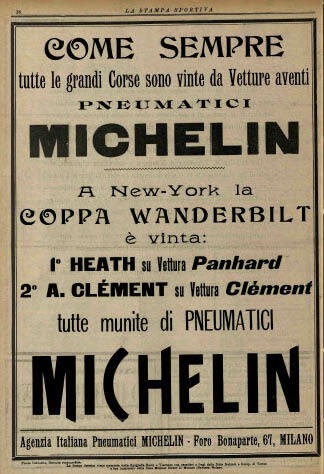 Michelin ran this ad in this issue celebrating their first and second place finishes.